Rancheria Mtn is a P900 in Northern Yosemite, the last such prominence peak I had left to do in the High Sierra. It had been high on my todo list for a number of years now, but for a variety of reasons I hadn't gotten around to it. For one, it's a pretty long hike, some 15mi each way from the trailhead at Hetch Hetchy with well over 6,000ft of gain. Secondly, it's not a terribly scenic hike, despite its location in Yosemite. Once one leaves the environ around Hetch Hetchy, the trail becomes mostly forested with few views, not the sort of hike I could get others excited about. I would have to save this one for a solo outing. 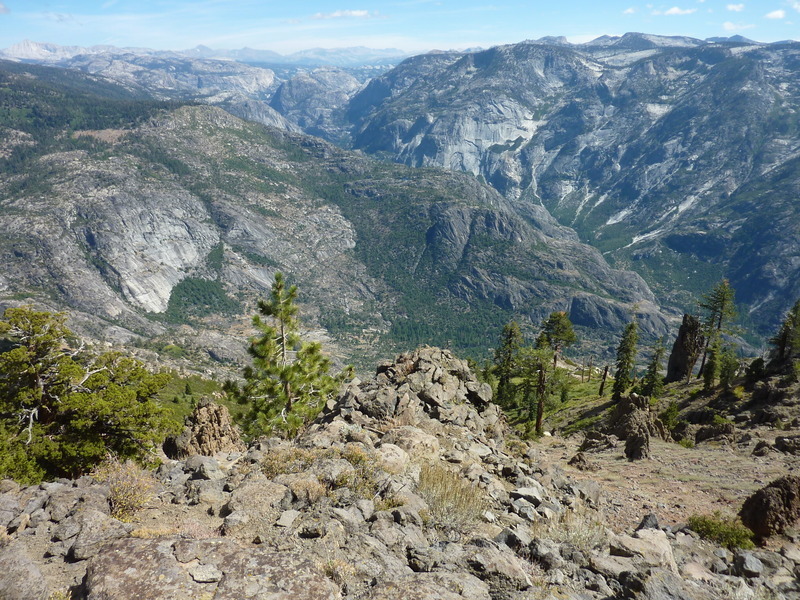 Lastly, the Day Use Only nature of the Hetch Hetchy area makes it somewhat involved to do as a dayhike. The entrance gate is open 8am-7pm, which makes it pretty tough to get in and out of there. Luckily, one is allowed to camp at the backpackers campground near the dam before and after a backpack trip, so one can get there early (before 7p), camp at the dam, then get up early and be back before it closes the next night. I didn't get to the entrance until well after 10p, so I spent the night outside, got an overnight permit in the morning (walk-in permits are still free in Yosemite, unlike SEKI), and planned to spend that night at the campground since I figured I had little chance of getting the hike done in 10hrs. The trailhead is another 20min of driving from the entrance booth where I got my permit, so it wasn't until 8:30a that I started out, a fairly late start given the 3,800-foot elevation where it would start to warm quickly. There were two vans from a tour group already there when I reached the dam, all of them with expensive dSLR cameras snapping away (a photo tour group? ), otherwise I had the entire backcountry to myself as soon as I passed through the long tunnel just north of the dam. I spent the first hour hiking to Wapama Falls and the bridges that pass just below them, a popular dayhike destination at Yosemite. The water levels were fairly low given the high snow year, but then again this was late September and not all that surprising. Temperatures weren't too bad really, so I had little to complain about there, but the late summer flies were out in annoyingly high numbers and would remain so until I was above about 6,000ft in another hour or so. I followed the trail as it continues around the north side of the lake and the iconic Kolana Rock that overlooks it on the south side. I passed by a second trail junction just before the trail goes over Rancheria Creek just above the falls on the last bridge. The water levels were low here too, but still scenic looking both up and down the creek from the bridge. Beyond this point the trail grows increasingly dull as it climbs steadily up through forest for the next several hours. There are some views across the Tuolumne Gorge to Smith Mtn where the trail goes by LeConte Point, but it soon goes back to forest. There are some sections overgrown with fern, buckthorn and manzanita that would have been horrible had they continued to the highest elevations when the cross-country would start. At the 7,700-foot level I found a small creek crossing the trail, the only water flowing across the trail for its entire length. I paused here to get some water and stash some Gatorade and a Starbucks Doubleshot, the latter for a caffeine boost on the way back. At 8,300ft the trail passes north over an imperceptible saddle. It was here, with about a mile and half to go, that I left the trail to head through the woods with easy cross-country travel - thank goodness there was no buckthorn up here to mess with. I found two points on the broad ridgeline that might qualify for the highpoint, separated by a fifth of a mile. The northeast summit is the point identified by LoJ and makes the better summit with superb views sweeping northeast to east to south, overlooking the immense Tuolume River drainage and the numerous High Sierra summits surrounding the scene in the background. There was a simple duck found there, but no register. The southwest summit, where I had lunch, is a volcanic rock outcrop in the middle of the forest with no views but a pleasant enough spot. There was a set of badly rusted nested cans but no sign of a register. I left one here while I ate lunch, not really wanting to go back to the more scenic location a second time. Maybe if someone finds this register they can move it to the other spot and let me know, though I suspect it may be some time before someone comes along. It was 2:30p before I had finished up and started back down. I picked up my cache at the creeklet and enjoyed a cold beverage, the caffeine coursing smoothly through my veins to give me renewed energy. So much so that I decided to visit LeConte Point on the way down, about 3/4mi off the trail where the trail crosses over into the Rancheria Creek drainage. The trail doesn't go through the saddle which would have been more convenient, but high on the shoulder on the side opposite the saddle, requiring one to drop down to the saddle first before climbing LeConte Point. The cross-country was mildly brushy but not too bad and I even found a few ducks that someone had used to mark a route back in the day. The summit was open to views in all directions, with the reservoir and Kolana Rock visible to the west, Mt. Gibson and Tiltil Mtn to the north, Smith Peak across the Tuolumne Gorge to the south, and of course Rancheria Mtn to the east. There was a tattered collection of loose pages and a notebook serving as a register, weather-beaten and waterstained, poorly kept in a rusted can. The oldest sheet I noted was from 1972 but I didn't look through them all, there were simply too many. I left a new register but don't expect it to last too long - the point seems surprisingly popular. Rather than return back the way I'd come through the saddle, I decided it would be quicker and more interesting to drop north to intersect the trail on its way down to Rancheria Falls. My biggest concern was in dropping to low where I might run across the poison oak that grows abundantly around Hetch Hetchy. To avoid this, I first diagonaled down across the north slopes heading northeast, getting through some minor cliff areas and eventually reconnecting with the trail just above the magic 5,500-foot level (I've never seen PO growing above this line). It was 6p by the time I returned to the bridge over Rancheria Creek. Half an hour later the sun was giving up its last rays on LeConte Point behind me, after which it began to grow dark, the waters of Hetch Hetchy growing calm with Kolana Rock standing tall as a sentinel on the evening watch. I managed to get back to the Wapama Falls bridges without needing a headlamp, but would need one for the last hour back to the trailhead. I paused to take a last photo of Kolana Rock not far past the bridge before continuing on. I saw not a single person since leaving O'Shaughnessy Dam in the morning and would see no one the rest of the night. There were several lights on in the occupied residences on the south side of the lake, but otherwise no sign of people. I had the constant chirp of the crickets to keep me company those last few hours with an occasional bark or howl from the coyotes.